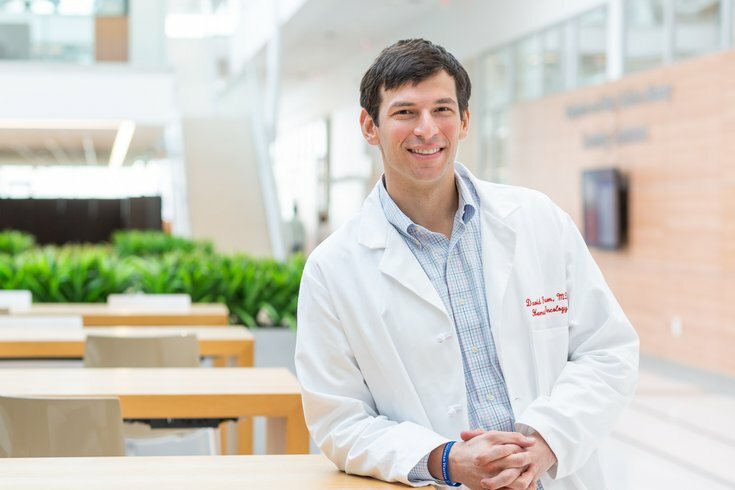 Dr. David Fajgenbaum, an assistant professor of medicine in the division of Translational Medicine and Human Genetics at Penn Medicine, studies the rare Castleman Disease, an immune system disorder that he has had for nearly nine years. Nearly nine years ago, Dr. David Fajgenbaum was diagnosed with a rare immune system disorder that kills 35 percent of its victims within five years of diagnosis. Fajgenbaum survived five life-threatening hospitalizations in the first three-and-a-half years of his battle with idiopathic multicentric Castleman disease (iMCD). But his symptoms have not returned in five years – an anniversary he celebrated January 5 with his wife and infant daughter. It's one he did not necessarily think he would see. "I've certainly turned the corner," Fajgenbaum said. "I know this thing can come back at any time. I'm doing the best I can to identify drugs that will help other patients with Castleman Disease." Relatively little is known about iMCD, the most severe subtype of Castleman Disease, including its cause and any cures. There is only one treatment approved by the U.S. Food and Drug Administration – but not everyone with iMCD responds to it. The disorder activates the body’s immune system, releasing an abundance of inflammatory proteins that can shut down the liver, kidneys and bone marrow. Fajgenbaum, an assistant professor in Penn Medicine's Translational Medicine and Human Genetics division, has been leading research efforts of his own disease for several years. He played a vital role in a series of significant developments last year, including the first treatment guidelines for iMCD. Fajgenbaum also contributed to a study that predicted patient responses to the only FDA-approved therapy treatment. And he oversaw the establishment of Penn Medicine's Castleman Disease Center, where research and clinical efforts will be streamlined under one roof. That Fajgenbaum not only researches Castleman Disease, but has the disorder, allows him to relate well to everyone involved – the researchers, clinicians and patients, said Dustin Shilling, director of operations, research, and strategic planning for the Castleman program. "It allows him to relate to other individuals that are recently diagnosed in a way that no other person can," Shilling said. "He hasn't seen the war, he's been in the war. Because of that, he's much more effective as a leader for the patient community, as well as the research community." Four years ago, Fajgenbaum earned his MBA from the Wharton School, recognizing that a lack of collaboration, limited communication channels and inefficient spending was limiting research efforts into his disease. This year, he is leading a clinical trial of sirolimus, a drug that possibly could be used to treat patients who do not respond to siltuximab, the lone FDA-approved treatment for iMCD. Siltuximab is only effective in about one-third of iMCD patients, Fajgenbaum said. And he is not one of them. Fajgenbaum said he has been taking sirolimus since his last life-threatening hospitalization. Back then, there was much less data about the drug's effectiveness to treat iMCD. An immunosuppressant, it is typically prescribed to kidney transplant patients. Fajgenbaum essentially served as his own test subject. The upcoming study could add to the data. Enrollment for the sirolimus trial will begin this spring. The clinical trial is backed by a five-year grant from the National Institutes of Health, the first awarded to iMCD research. "What we hope to find is the proportion of patients that do improve with sirolimus," Fajgenbaum said. "We hope it's a very high proportion. We're expecting that not everyone will improve, but we would love it if everyone did." Different treatments may prove effective in some patients, but not others, Fajgenbaum said. He is committed to finding a multitude of treatments. "What we need are solutions so that every patient who is diagnosed has a drug that will work for them," Fajgenbaum said. Because Castleman Disease is rare – about 5,000 people are diagnosed with varying subtypes each year in the United States – many physicians have not encountered the disorder, nor are they very familiar with it. Fajgenbaum served as the senior author of the first iCMD treatment guidelines, established last year by a group of 42 experts from 10 countries. Of the various developments made last year, the guidelines will have the biggest impact on iMCD patients right now, Shilling said. Similarly, experts developed the first diagnosis guidelines in 2017. "It's really important to treat it aggressively and quickly," Shilling said. "Your immune system – it's like a building on fire. If you can get that fire out before it spreads to the whole structure, you're great. ... If you can treat people aggressively and diagnose it quickly, you can really prevent them from getting to stages where they end up passing." The experts examined 344 studies, standardizing the first three lines of treatment for iMCD. The group identified the FDA-approved siltuximab as the top treatment option. "It's got a lot of reasons to make that No. 1," Fajgenbaum said. "After that, the real challenge is to know what to recommend next. That's the big issue. There's a huge drop-off of data." Researchers took steps to mitigate that challenge last year, too. A Fajgenbaum-led group developed a model that accurately predicted the responses of iMCD patients to siltuximab therapy at an 85 percent success rate. The study needs to be validated in another cohort, but the findings could one day help medical professionals determine which patients will respond to the antibody. "We thought it was important to understand who are the patients that are likely to respond and who are the patients not likely to respond," Fajgenbaum said. "The more inflammatory symptoms and signs you have, the more likely you are to respond to that drug." There are about 15 other research studies, at varying stages, that have implications for better understanding Castleman disease, Fajgenbaum said. At Penn, research efforts will now be streamlined under one roof, thanks to the establishment of the Castleman center, the first of its kind in the United States. It will include a multi-disciplinary team dedicated to clinical care, translational research, education and clinical trials. Right now, Fajgenbaum said, each of those parts are spread across campus. "We wanted to bring everything under one umbrella," said Fajgenbaum, who will lead the center. "It's a way to bring together the research, the clinical trial, the clinical care, (and) the aspects of education all under one roof, and to connect us in a formal way."